The vast majority of tactical Christmas stockings are uninspired jokes. Gear makers just sew a stocking from 1000D nylon and then add all manor of garish pouches, zippers, webbing, over wrought handles, d-rings, and loop material. They’re fun but forgettable in a sea of similar stockings. 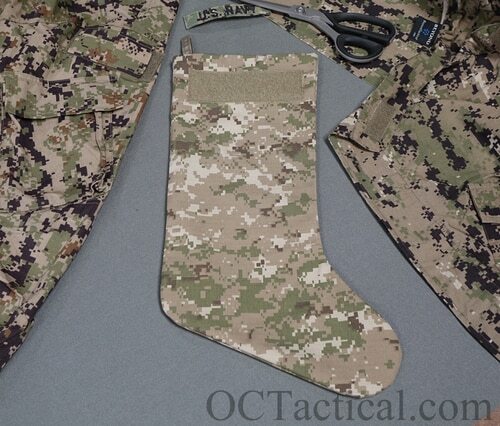 OC Tactical’s Christmas Stocking is just the opposite. These stockings are truly unique and have become something of a tradition around my house. They create a limited run of rare or historically important camo stockings every year. They are a great collectors piece for camo nerds. These stockings are finely made with original fabrics or meticulous reproduction fabric, lined with LITELOK fabric, and feature a small loop field for adding patches. Past stockings have featured original Vietnam era Tiger Stripe material in 2015, special reproduction Rhodesian camo in 2016, original ERDL camo material from 1978 for the 2017 stocking, and now a batch of what may be the rarest fabric yet… The 2018 stocking will feature Universal AOR! This year’s run of custom Christmas Stocking is truly unique. I made these with some of rarest camo fabric on the planet. This is the camo some have called the Universal AOR pattern from the Navy’s camo testing. I was lucky enough to get my hands on bunch of the test patterns awhile back including a small amount of this. The only other example of this fabric I know of was photos posted by legitkit years ago of a uniform top made by Beyond Clothing. This is a one time deal, once they are gone I will not make these again. This is a stocking that you do not want to miss.